There’s still enough wintertime for this dish…….. especially with yet another major storm bearing down on Minnesota. There’s still enough of winter for a slow stove-top meal, one that fills your kitchen with a heady fragrance, a simmer that beckons one and all from the cold and wind to a wide shallow bowl of tender meat and vegetables, rich with rosemary and basil. Winter still has us in it’s grasp despite the longer hours of the day, our luck changing as we see traces of the sun through our dinner hour, a few more precious hours of light in the afternoon when school is done. Pick a slow weekend day if you can, to enjoy the hours with a bubbling pot on the stove, as sun moves to twilight. Or place it all in a crock pot before you head out the door for work, then come home to a sensational smell, and a hearty rustic dinner. This is the quintessential Winter meal; it’s warm and rich and soothing and amazingly good. It’s rustic and simple and easy to prepare. And it makes good on the promise of chasing the cold away. Recently I attended a dinner that featured organic Muir Glen tomatoes, and as we gathered our coats to leave, smiling from content tummies, chatting heartily with each other, the sponsor of the meal handed everyone a gift bag that held a small cookbook of tomato recipes, plus a sampling of some of Muir Glen’s finest canned tomatoes. The dinner, highlighting Muir Glen’s specialty selection of canned tomatoes, the Meridian Ruby variety, was held at five locations with their resident chefs around the country, the local establishment being Corner Table in Minneapolis. The small booklet that came with the gift bag had recipes that made my eyes dance with delight, and the very first one listed was the traditional Ragù recipe from Cascina Spinasse in Seattle. The restaurant serves traditional Northern Italian fare, which includes this hearty meat-based sauce; slowly simmered pork and beef, with minced carrot, celery, onion and garlic to round out the flavors. Add wine, Muir Glen’s fresh and flavorful Meridian Ruby tomatoes and let it bubble contentedly on the stove for a few hours. Who needs a plane ticket? Ok, I agree…. a plane ticket to Italy would be fine, yes. BUT…. this dish is far cheaper. As it cooked, simmered and blended on the stove, filling my kitchen with it’s rich scent, I felt like I’d be selling such a beauty short by serving it over boring old pasta. I know it would taste fine, sure…. but its decadence and hearty flavor made me wish for a creamy soft polenta to top it with. 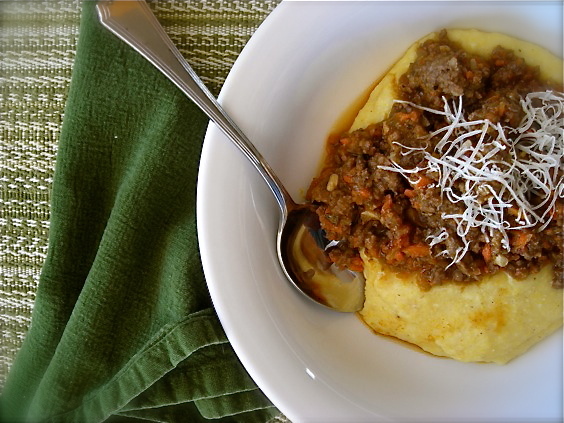 After all, if this Ragù was traditional Northern Italian fare, then a bowl of creamy polenta would be a natural base. And there I kind of balked. It’s a good thing the pot went in the refrigerator overnight so I could mull on how best to tackle this need. Because you see, several years ago I went through a phase where I repeatedly tried polenta, in as many forms as I could manage. I tried it with white corn meal, in true Southern Grits fashion; I tried it in solid form, broiling or searing small cakes of it to golden perfection before topping it with whatever I was experimenting with at the time. I tried recipe after recipe of soft polenta and every single time I ended up disappointed, or worse, really turned off. I decided that maybe I just didn’t like polenta, but then I’d try it in a restaurant and be bowled over with how delicious it was. And I loved cornbread, corn muffins, hush puppies and corn fritters, so what was it about polenta that I couldn’t manage? I’m pretty sure it was the cooking method, but by the time I figured it out, I was so over making it at home. And I haven’t attempted it since. This time, I was determined, and after consulting with my friend Shaina, I armed myself with some of her knowledge and feedback and headed into the kitchen. Thirty minutes later, a pot of superbly creamy and flavorful polenta was waiting for the rich and hearty Ragù. The first bite made me swoon, eyes rolling in delight. It was, through my hands and a little attention, the most delicious food I’ve ever made at home, and it was happily making it’s way to my mouth. I cook a lot. And I cook really well, but this was the first time I think anything I’d made could stand up to the food served in a good restaurant. But then, I suppose when you have with a recipe that comes from one of Food and Wine’s Best New Chefs of 2010, that’s probably a good start. In a 4-qt dutch oven, brown the meat with salt and pepper over medium heat until no longer pink. Drain fat using a colander over a large bowl. Discard fat, set meat aside. In large food processor, place onions, carrots, celery and garlic and process until finely chopped. In same dutch oven, add olive oil, vegetables and rosemary, cooking for about 15 minutes or until vegetables start to brown. Add tomatoes and meat to pan, stir to combine. Cook approximately 15 minutes, until tomatoes darken slightly. Add red wine, increase heat to medium-high and cook until liquid reduces by about half. Add chicken stock, reduce heat to low and simmer, stirring occasionally, for 3-4 hours. Stir in nutmeg in final minutes of cook time. KATE’S NOTES: For extra richness in this dish, I added about a half cup of heavy cream with the chicken stock. I think it made an exceptional addition. When you add the stock, the mixture will be very loose, like a soup. It will reduce as it simmers though. I did not cover the pan as it cooked, but I doubt it will make much difference, although it may take longer for the liquid to reduce if it’s covered. KATE’S NOTES: Be aware that Polenta, as it cooks, bubbles like molten lava, and it can be dangerous if not kept partially covered. Keep the heat low to prevent the bubbles from exploding violently. And when you stir the polenta as it cooks, make sure you are scraping the pan bottom thoroughly. I used a flat edge wooden spatula for this. A heat resistant rubber spatula would also be a good option. free of charge as well. I was not paid to endorse or even mention Muir Glen Meridian Ruby tomatoes, Chef Stratton’s restaurant, his recipe or any other information found here. The opinions in this post are strictly my own. Mazeltov on the freebie meal! Free stuff can really be awesome. I’m kind of a have your cake and eat it type of guy, so any chance I can have the delicious ragu and polenta and a plane ticket too? Exceptionally good looking dish! The ragu and polenta combine for the perfect comfort food. It almost makes me glad it is still winter! 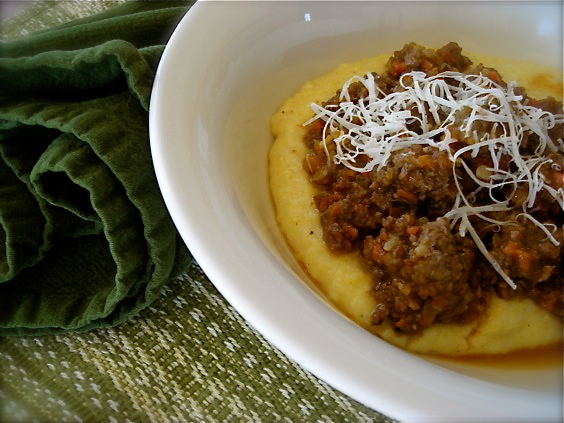 I love polenta!This looks like the perfect comfort food! Thanks so much for sharing your link with me on Facebook!